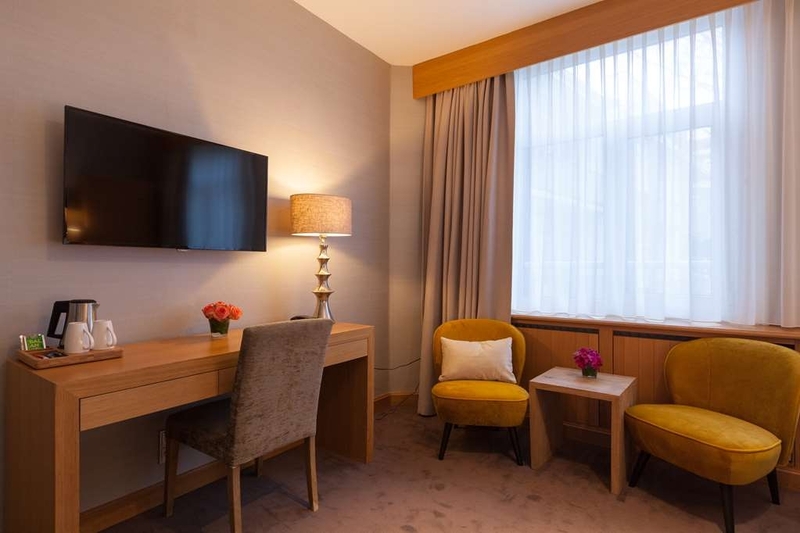 The Best Western Delphi Hotel is ideally located in the center of Amsterdam. Come and experience our hotel near the major tourist attractions. Best price guaranteed and exclusive deals. Conveniently located in an up scale part of town, away from the hectic heart yet still within walking distance of attractions, is the luxurious Best Western Delphi Hotel. 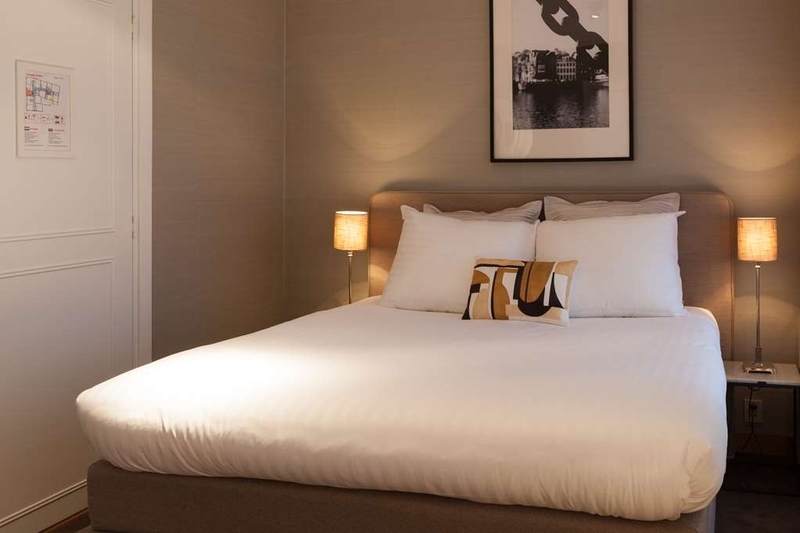 Recently renovated, this 4-star hotel offers spacious and contemporary rooms with fluffy duvets in fine cotton sheets. The bar and lounge provide an opportunity to unwind after an intense day. The small scale of the hotel guarantees an intimate atmosphere and personal service. 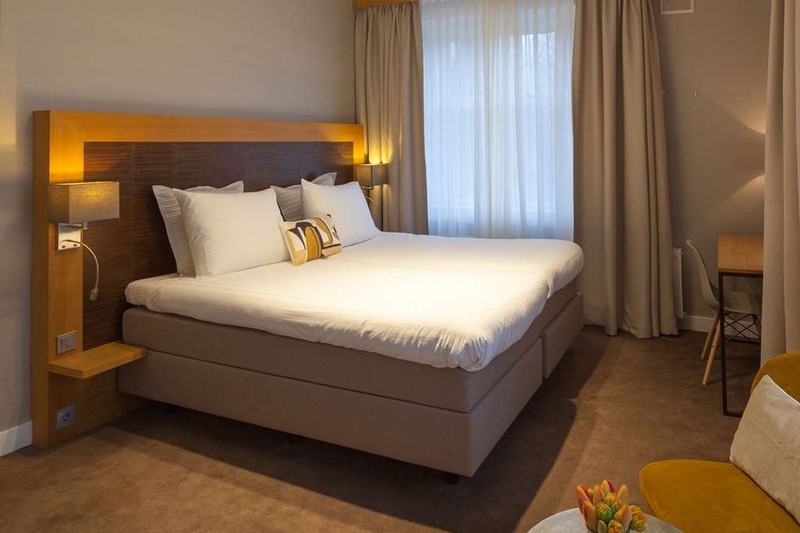 With a tram stop just 100 metres away from the hotel, the city centre and Central Station can be reached easily and swiftly. 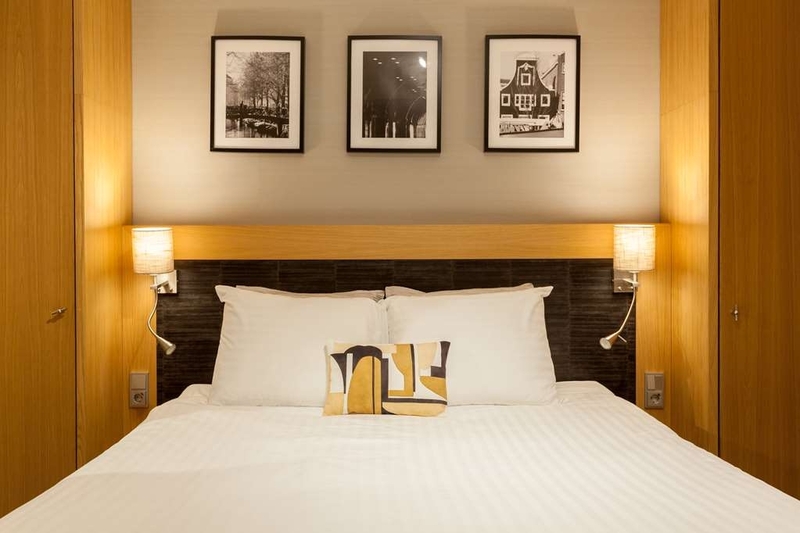 Within a 15 minute walk, guests will find a wealth of international restaurants as well as the RAI convention centre, Vondel Park and major shopping streets. 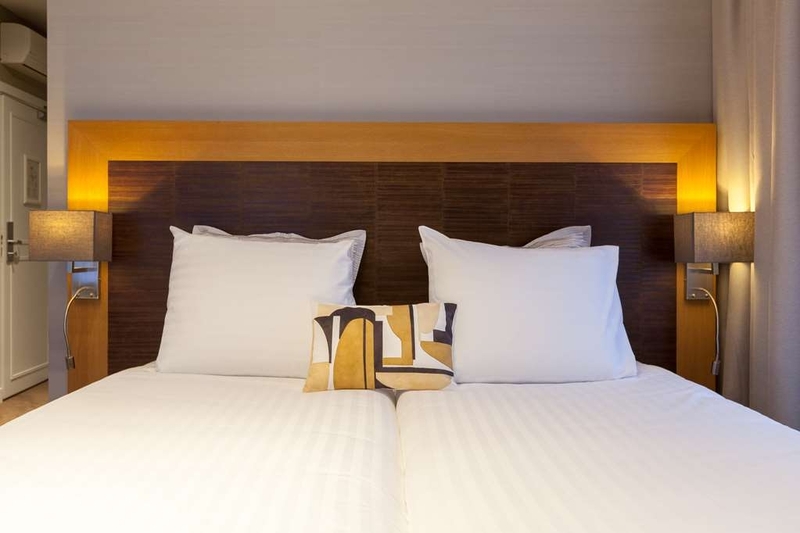 The recently renovated four star hotel offers spacious rooms with quality beds and soft sheets. The Best Western Delphi Hotel offers both Classic and Executive Rooms. The classic rooms are decorated in a classical style with warm colours. The big windows offer a view of the beautiful Apollolaan or the garden. The rooms are equipped with all common facilities, including quality beds with nice sheets enabling a very good night's rest. To relax, you can watch the newest movies on the pay TV system. The executive rooms are recently renovated and luxurious decorated in a modern style. The materials used are of high quality and all facilities are offered to ensure you a more then comfortable stay. Extremely disappointing experience in terms of price-quality. For same price you can choose better hotels closer to city center and with better quality of furniture, food and stuff. Really bad breakfast. 16€ for dry food is a waste of money. Please note that this hotel has too much negative feedback for some time and has no intention to change. "Quiet location, fantastic breakfast, parking problematic, unfriendly reception." We came here for the Rembrandt exhibtion and enjoyed our stay here except for the parking and the reception very much. Only just found a (small) space and paid 21 euros for 1pm to 9pm, Saturday night and Sunday is free. However, on arriving, the room was not ready so had to leave our bag at reception but was amazed at having to produce our credit card to guarantee 50 euros for bar orders /damage whatever, despite having a best western loyalty card and having booked through their website. Rather insulting. Then in the morning, the receptionist told us the room had been paid with the credit card details, without having asked us first how we wanted to pay, which is rather unusual. We would have preferred to pay with our BW vouchers and appreciate having the choice rather being presented with a fait accompli. Not sure would stay here again. My wife and i stayed here for a midweek break. First of all, the hotel is very clean and tidy. The reception staff is excellent with special mention to Sherief who was particularly friendly and helpful with tips for travel and restaurants. Our room was spacious and clean with a safe and tea/coffee facilities. Breakfast was very good with hot and cold choices. The hotel also offered free all-day coffee and cake in the lounge. Delphi is in a very smart part of town with many bars, restaurants and shops within a 5 minute walk. Frequent trams to the centre every 10 minutes and only taking 15 minutes to the centre. All in all a great hotel in a great location. 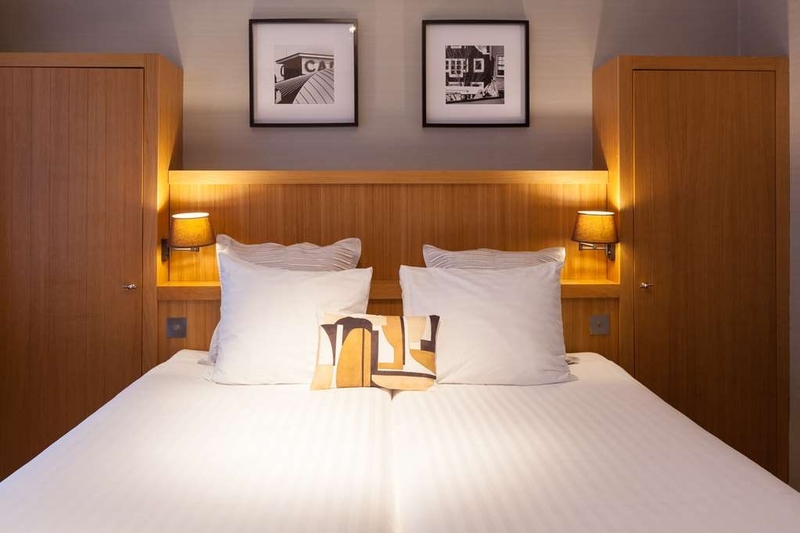 Good clean hotel well located within easy walking distance to the Museum District and Tram stops which connects you easily to the city centre. Rooms are a good size, cozy, quiet and clean. Staff are extremely friendly, helpful and professional. 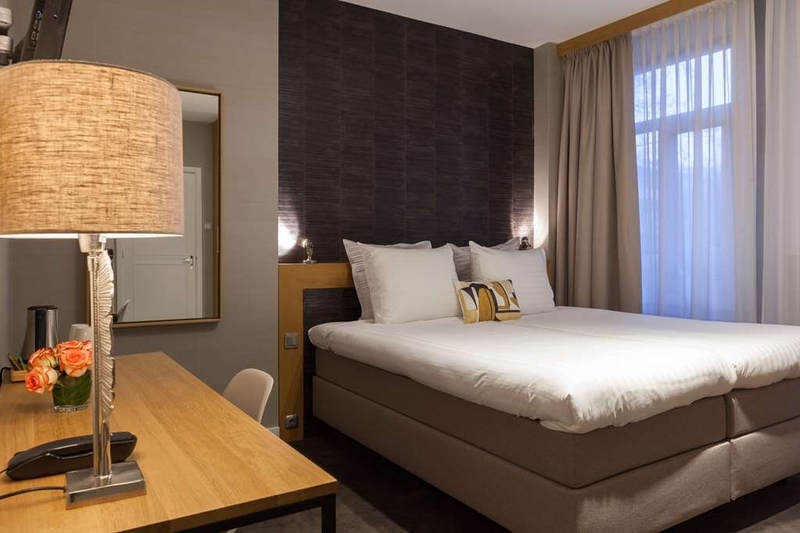 "Comfortable hotel in a good location"
On a quick business trip to Amsterdam, wanted a hotel that was close to the office complex at Amsterdam Zuid but also an easy walk to the Center City. This hotel met all requirements very well -- you can either take a quick tram ride from Amsterdam Zuid or a pleasant walk. Similar to get to the Center City. Hotel is in a quiet area one block from a canal with well-kept homes, and the whole experience made me feel much more that I was in the heart of Amsterdam than if I had stayed in a modern hotel among the office buildings. Enjoyed the breakfast too. Very nice area, 10/15 minutes walking to Van Gogh Museum and Rijksmuseum. Well connected to the city center. Very nice and professional staff. The Hotel is cozy, quiet and clean. Highly recommended if you would like a good and quiet close enough to the noisy center. Dear Guest, Thank you very much for staying at the Best Western Delphi hotel. We are all very pleased to read that you have enjoyed your stay this much and that you have experienced the hotel staff as nice and professional. We will definitely share your positive words with the staff. Thank you again for staying with the Best Western Delphi hotel and we are looking forward to welcome you again. Stayed for 2 nights at the end of February. Gold status Best Western Rewards Members- not that this hotel cares. We stayed with our points and were given a lovely room-clean and comfortable and the woman who checked us in was pleasant. Before going to sleep, I went to close the main window. As I was closing it, I felt a sudden sharp pain on my leg- one of the armchairs had a large split in the upholstery and large staples/ mini nails were sticking out of it and had cut me. My husband went down to the front desk to get bandages and to let staff know about the chair. We were told that we would be helped more in the morning once management got in. The next morning nobody said anything to us. When I asked the woman at the front desk if she knew about what happened, she said she hadn't heard anything. This was very disappointing because this could have sent me to the hospital. We understand that housekeeping sometimes misses things, but the staff acted as though they could have cared less. Nothing further was done to accommodate us. "Good hotel for a reasonable price"
Stayed at the Hotel for a meeting nearby. The hotel was small but cozy. 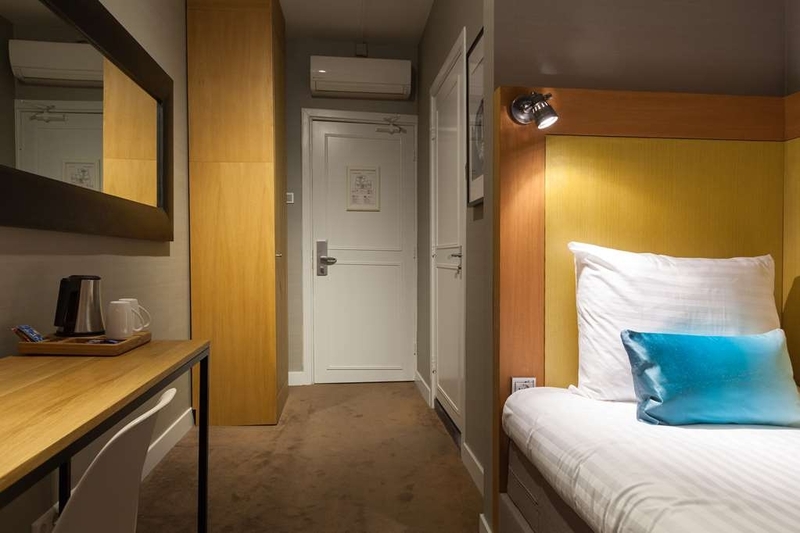 For the prices, rooms could be better equipped (for example with a fridge or minibar). There are some restaurant around the hotel, but not quite cheap. Overall was a good/ok experience. Nothing special but nothing to complain about. "How dis they get 4 stars??" I satyed for one night on a business trip. The receptionist was nice and helpful but couldn't see my correct reservation which included breakfast. He finally confirmed that breakfast is included after checking the system few times. The next morning breakfast had limited options but the quality was wuite good. Getting to the room negative points start The room was tiny, smallest I've ever seen anywhere in the world. The wardrobe didn't have a door handle which was surprising . No, it wasn't sliding door either to be exact the door handle was broken, removed and never replaced The hand wash sink was not draining the water. I didn't notice first and then had to dip my hand into dirty water to remove the metal filter on the drainage. It wasn't a stopper plug and just a filter which should have worked without touching. We stayed at this hotel at the start of June which is a great time of year to visit the lovely city of Amsterdam. Some features are great - the location is perfect, in a nice residential area near local restaurants and shops but close enough to walk into the centre or go to other parts of Amsterdam, the breakfast was also lovely with lots of good food and choice , and the staff were very friendly, but the bedroom was so basic - firstly it was tiny - just about enough room for the bed, it had no air conditioning so you either sweltered inside the room or slept with the window open and could hear traffic, clothes storage was minimal - just a tiny cupboard - and the bathroom was so small the toilet had less space than you would have on a plane! Lastly you could hear doors banging all of the time. I'm just so grateful we were only here for 2 nights and in the summer, because staying in that bedroom in the winter would have been awful. Unfortunately for that reason we would look elsewhere if staying in Amsterdam again. "Nice hotel, helpful staff, beautiful neighborhood"
This is a nice hotel in a very beautiful neighborhood. Less than 5 minutes walk to the tram stop to go to the museum square. A couple of good restaurants also nearby. My room was nice and spacious and clean. The hotel staff was very helpful and informative. 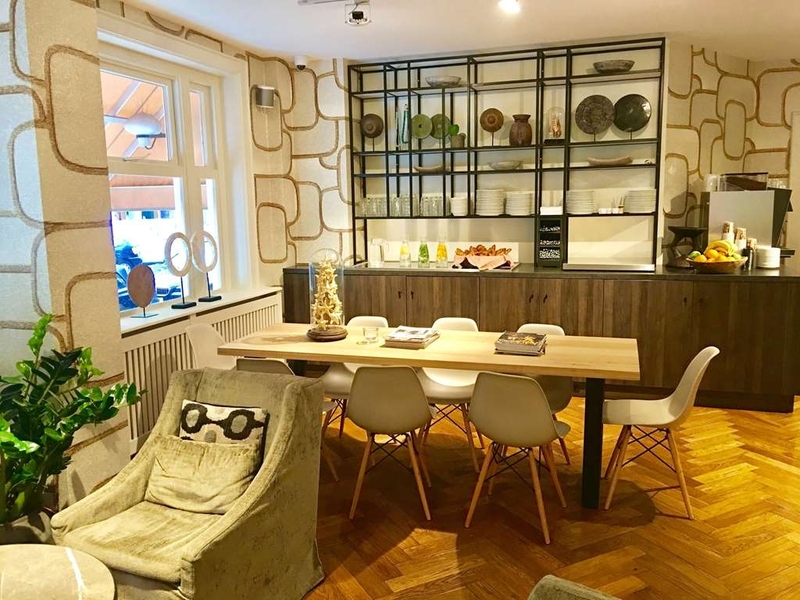 Very nice hotel nicely located evenly far from Amsterdam Zuid boiling business area as from Amsterdam city center with myseums and restaurants. Highly recomended! I for sure will be back to this hotel. For me, this was a good location a bit out of the touristy center. Hotel is what you'd expect from a four star European hotel. My room was updated, air conditioned., and clean. Trams to city attractions are two blocks away. Today using 7 euro day pass to go all over. Access from airport via short train ride and short tram ride was easy and cost 6 euros. Breakfast at 15euros was good, not great, but I am not complaining. I stayed for a week on business. It was expensive compared to a lot of other hotels so I had high expectations. I was extremely disappointed. The staff are (with a couple of exceptions) unfriendly, unhelpful and just minimally polite. The housekeeping service was very poor. Cleaning was just about acceptable, but well below the standards of a hotel at this price. The sheets on the bed didn't fit properly, so they unravelled at night, which is unhygienic and uncomfortable. 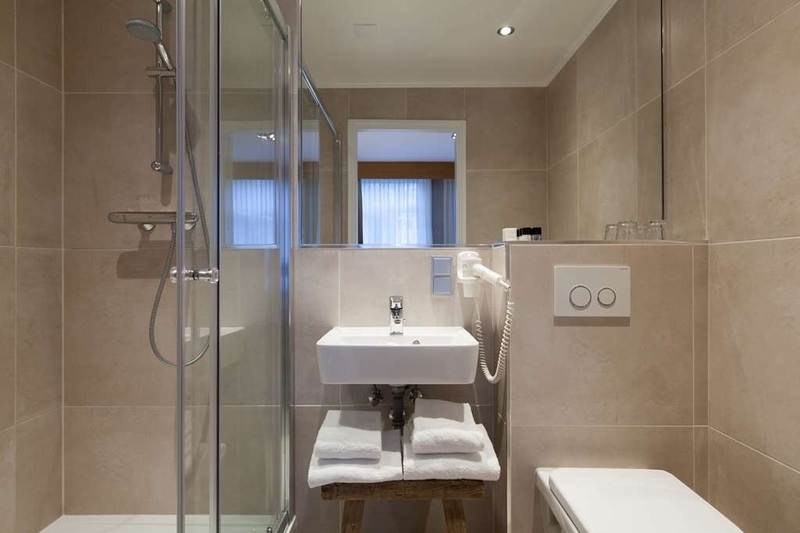 There were insufficient coat hangers in the wardrobe, the poor quality toiletries didn't get replenished (nor did the instant coffee sachets), there's no notepad and pen, and no handcream in the bathroom, all of which you expect when you are paying the high prices at this hotel. Just borrowing an iron and ironing board was apparently too much trouble for the staff. The breakfast buffet featured soggy fruit salad, stale bread and weak coffee. The unsafe lift might be a quaint touch but surely a proper safety door can be added. Overall, if I'd been paying half the rate, I probably would have been satisfied, but this was very poor value for money. We had 3 people in one room and all our beds were so very comfortable! The room was clean and comfortable, with enough space for all of us. The hotel staff was wonderful, the free breakfast was very good and more than we expected. All in all a wonderful stay. The only spot on the whole stay was that we asked for wash cloths and were basically given a lecture on hygiene by the gentleman we were referred to. As he kept loudly telling us that they do not have wash cloths as a matter of hygiene because people do not just use them on their faces, and no amount of washing can get them clean. I wanted to ask him if he thought people only used the towels on their face, but instead just repeatedly said okay Thank you to try and get him stop. Other than that our stay was quite wonderful! And the rest of the staff excellent. TThis was my first trip to Europe. My view of the world has changed. We were grateful to be taken in at this property. The other BW hotel was too far away and didn't have air conditioning. The staff is fantastic! Sharif, George and Andy provided superior customer service throughout our stay!?? We had a blast!!! The metro was an easy and inexpensive way to get around. ?? Be careful of all of the bicyclists. Almost got runover several times.?? I recommend the Fidelio restaurant, the Heineken Experience and the BigBus tour but, be aware that their service stops early. We got stuck at the Luxembourg Gardens and had to take a taxi back to the hotel. On the downside, the wifi didn't work in our room. We had to go to the lobby to plan our day. Also, this core Best Western is way too expensive. The price was indicative of a Premier property. 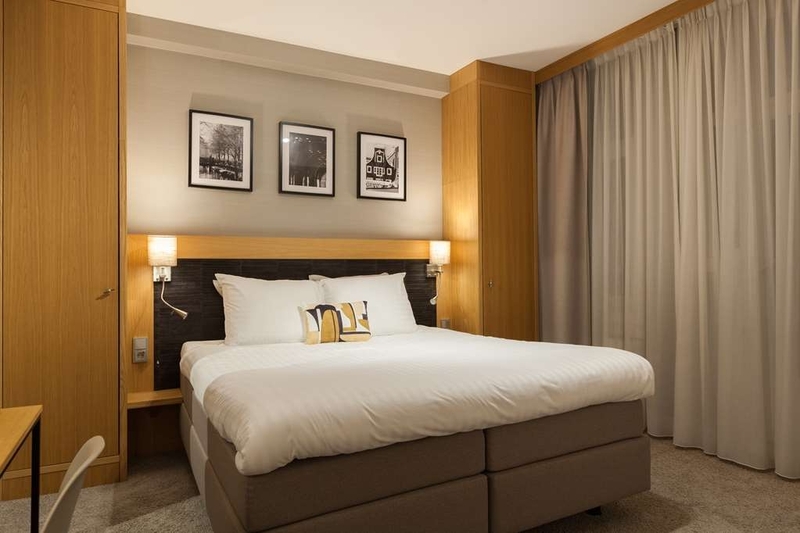 "Nice hotel and helpful staff"
The BW Delphi is in a nice location within the Museum quarter. There is a No. 5 tram stop near by that will take you straight into the City Centre. However, if you like walking it is well worth it as you will see some beautiful streets and some wonderful architecture. The hotel is very nice, although it does not have a spa as Trip Advisor seems to suggest. The staff are very helpful and friendly. Good selection of shops and eating places in the local area. 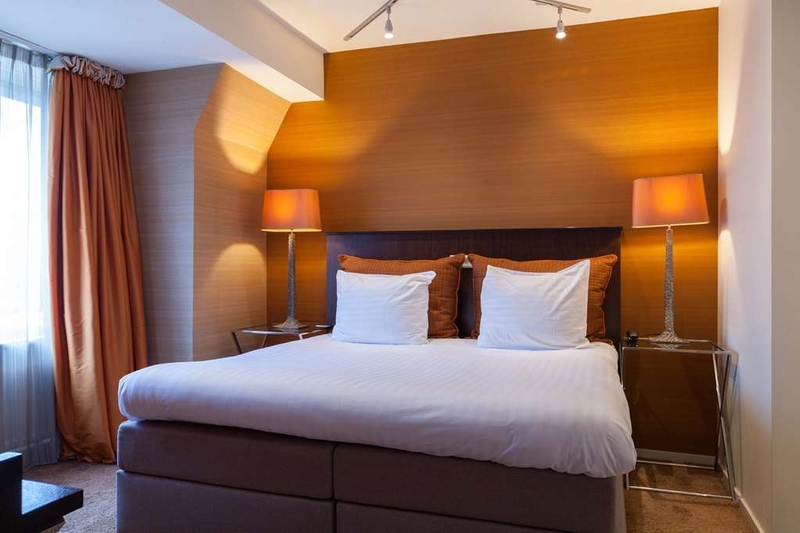 Great hotel, in a great location, friendly and informative staff, lovely breakfasts, found the location of the hotel ideal for getting into the centre of Amsterdam, trams just a short walk away with lots of shops and restaurants on the doorstep. Found our time spent in Amsterdam very relaxing. "Great Location If You Are Visiting the Van Gogh Or Rijks Museums"
About a 25 minute tram ride on Tram #5 from Amsterdam Central. Get off on one of the stops along Beethovenstraat. Not the most glamorous hotel you will stay in, but it's far enough away from the busy streets of Amsterdam to give you a nice, quiet respite. If you are visiting the Van Gogh or Rijks Museum, this is an ideal place. You can walk to either museum in no more than 15 minutes or just hop on the #5 tram for approximately 3 stops. This hotel location had one of the best breakfasts of any of the Best Western locations we stayed at in the Netherlands and Belgium. The breakfast staff was very attentive to what they were doing and were extremely friendly. Our room was big and spacious. There is no air conditioning which concerned me at first, but the climate here is such that we just kept the windows open. Sleeping was not an issue. The shower temperature is Europe, in general, should be of concern. Seems like they do not regulate the hot water temperatures. Be careful as it is fairly easy to get scalded if you do not test the temperature of the hot water. All and all, a great location without a lot of frills. Check in is at 3 pm, but they were more than willing to store our luggage until we came in later that day and after a day of touring around the city. We felt the staff was caring and helpful. We would stay here again if given the chance. "Good Location but the staff is very arrogant, in fact dishonest." "Our go to hotel for Amsterdam"
I have stayed at this hotel at least 5 times thru the years for all the reasons already posted. It is one block from Beethovanstraat which has lovely restaurants, shopping, and tram stops to access the rest of the city. It isn't far from the train station either which is a cheap way to get to the airport. We rented bicycles for a few hours which is a great way to explore Amsterdam (please be careful!). The staff is always helpful. They have wine, beer and some liquor available for a night cap too. They recently remodeled the lobby area and it is super comfortable and welcoming. The free wifi is decent speed. We stayed on the ground level in a very large room and it did have a/c which worked great. I am sure we will continue to use this hotel for our future trips to this great city. Very pleasant stay. Location I deal, just a short tram ride to the city centre. The location around the hotel had plenty of restaurants close by if you didn't want to go in the centre. The staff where friendly and helpful what more do you want? This was my husband's second stay here and my first. Definitely will be back! Staff is very helpful and friendly. When we tried to reserve a room, they were full. But they were able to find us a very small room, which was quite adequate. Breakfast buffet was well laid out and very good. Tram stop is close by, which makes it so easy to get anywhere you want to go. After being in the crowded Dam Square or Central Station, the quiet and peaceful neighborhood was a relief at the end of the day. "Small hotel - great value"
This is a friendly hotel in a quiet area of Amsterdam, yet very close by tramway to all major attractions. The staff is helpful and kind. The rooms are comfortable and stylish. The buffet style breakfast is excellent. Highly recommended. 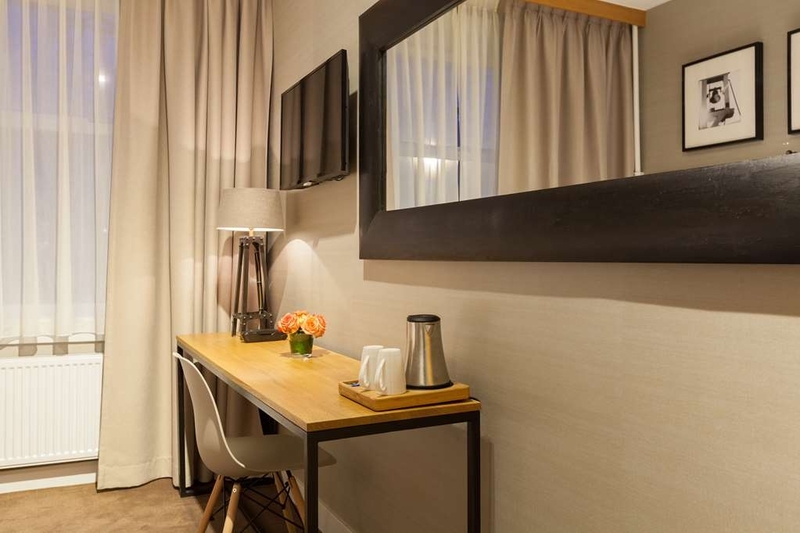 "Best Western Delphi Hotel Amsterdam"
The Best Western Delphi Amsterdam, is one of the best price wise and stay inAmsterdam,close the city centre and next to museum square and Albert Cuip Flee Market. I totally reccomend for everyone to stay. The services are beyond exellence plus the people are really friendly . Nice hotel in a quiet area. Comfortable room with good facilities and excellent breakfast choices. Air con could have been better as room was a bit stuffy but balcony doors made this a bit easier. In fact the whole hotel was a bit stifling and could likely do with more efficient air on, especially at the relatively high price. We would definitely stay here again. Perfect location. Walking distance to museums, restaurants and shopping. Comfortable and safe in room. Very nice staff, great breakfast (15 euros). Clean and very quiet. Won't deplete your wallet! Highly recommend. 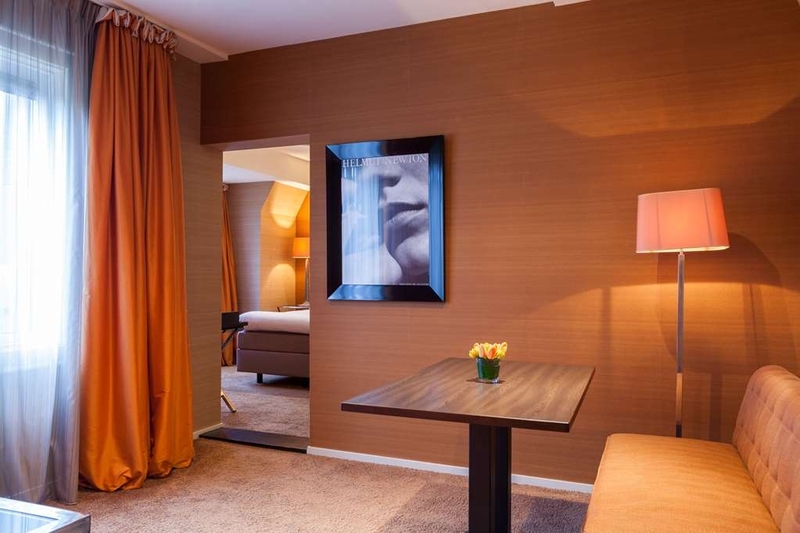 "This will be our 'go to' hotel in Amsterdam without a doubt!" In a very nice location, close to several really good restaurants and shops, yet quiet and restful and very convenient for trams. The hotel itself is elegantly furnished, spotlessly clean, with comfy good size beds. Our room had double doors leading to balcony overlooking a garden. Even though the guests were plentiful we didn't hear a mouse at night and slept really well. Breakfast options were Fresh and good quality, free coffee and pastries on offer all day were very good. Staff members were delightful and made us welcome with nothing too much trouble. Wonderful standards of care all round. Everything there was perfect. The staff was very nice and helpful, the breakfast was good and rooms were clean and comfortable. There is free Wi-Fi with good speed. The hotel is situated at a very convenient place easy to find from the Airport and city center, not more than 200 meters tram stop. This hotel is well situated, free tea and coffee all day, nice clean spacious room, good friendly staff from reception to room attendants, nice breakfast plenty of choice, trams ideal 5 and 24 Central comfortable stay, would highly recommend ?? 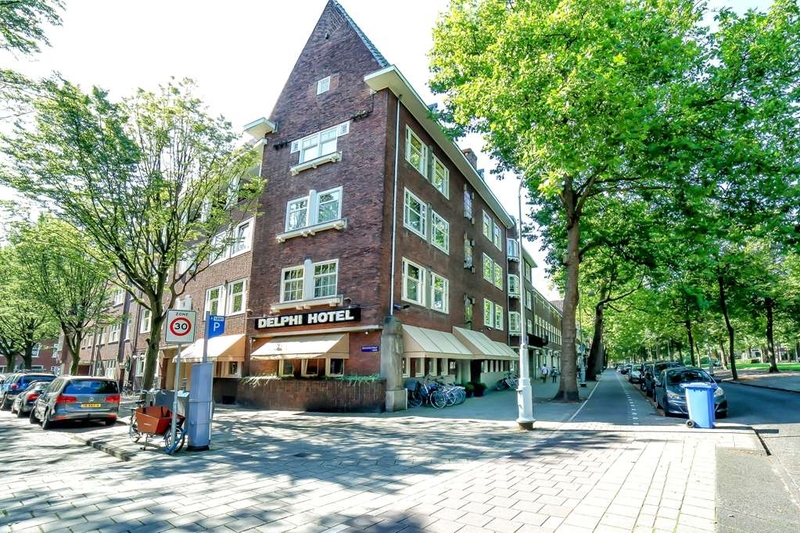 The Delphi hotel is a great hotel at a outstanding location in Amsterdam. We loved the area where te hotel was located (only 5-10 minutes walking from the museumquarter). The staff was really helpful with diner and drink options in the city. The breakfast was also great as they have a big variety of options. Rooms are very cosy and lovely decorated. We will be back guys!! 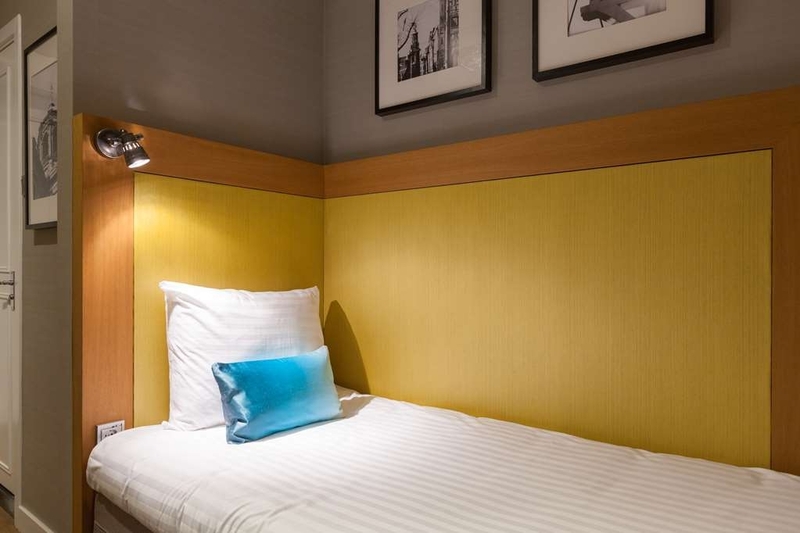 A cosy and warm hotel located a few tram or bus stops from the main Museums quarter and just a few more from Dam square and the buzzy city center. An ideal location for travellers like my friend and me who wished to spend a 2-night stay on a week-end and discover the city cultural heritage as well as its historical yet modern atmosphere. We got in with a detailed to-do list which was definitely improved by Mr. Sherif, the Reception attendant who checked us in. He delivered a thoroughly professional service and so exhaustively he provided us with a full guide to the best places in town in terms of both sightseeing and places where savouring delicious local food. The twin-bed room we were assigned was spacious, comfortable, very clean and quiet. The breakfast was superb, with a wide selection suitable to all tastes. Furtherly, they score another point for offering the facility of tea, coffee, juice, cake, around-the-clock in the cosy sitting area. Not a joke when you reach the hotel back from hours of sightseeing in the cold and wet winter time. We therefore extend a special thanks to all the Hotel team members who so efficiently made our short holiday so comfortable and memorable. Keep it up! "Not a 4 star. Barely a b&b. Avoid if coming to conference centre." would give a zero if it was possible. Room is tiny, phone doesn't work, safe is broken, heating is broken. Staff rude af. Night porter a bit decent and brought me a heater. 18 inch TV. This is not a hotel it's a joke. The porter admitted he hears my comments a lot on facilities and staff behaviour. Charged £100/ night for this joke. No cupboard btw either. This room is for hobbits. "Good Hotel, daytime receptionist awful"
The hotel is conveniently located to the Center of Amsterdam, walking distance. Rooms are ok, everything you need is there. Quiet location, good breakfast. The evening/night receptionist was a very friendly guy, but the daytime receptionist (male) was rude and totally not interested in guests. Rest of the staff ok. Thank you for the worm welcome to the receptionist on duty. Free coffee ad tea in the very comfortable. The room 252 is just amazing! Nice view and big size! Also not to far from the center, only 20/30 minutes by walk. "Good base but just a bit far out"
The staff were excellent and our room was large and spotlessly clean. The neighbourhood was quiet but nice and very safe. The only negative is that it was easy to get into the centre by tram but was a bit too far out to walk. "Small, charming but very OK"
Small hotel with very nice rooms in a rather quiet neighbourhood. Breakfast is OK, not that many choices but good quality. Vey small bathroom but everything in the rooms are in good shape. Lobby and reception area is very small. It is an old hotel. "Feels like home.... fantastic hotel!" I can't say enough about this fantastic hotel - we stayed here for four nights and had an amazing time. First of all, the staff is both professional and kind, and made us feel at home every moment of our stay. In almost every hotel I stay at, I tend to wake up with back pain - the beds at Delphi are super comfortable, allowing me a great night of sleep and no back pain. Third, the breakfast buffet is delicious and has the feeling of good friends making an extravagant breakfast for you - every morning. We will stay here again as soon as we visit Amsterdam in the future. Dear Delphi Hotel staff: thank you for making our trip so wonderful! 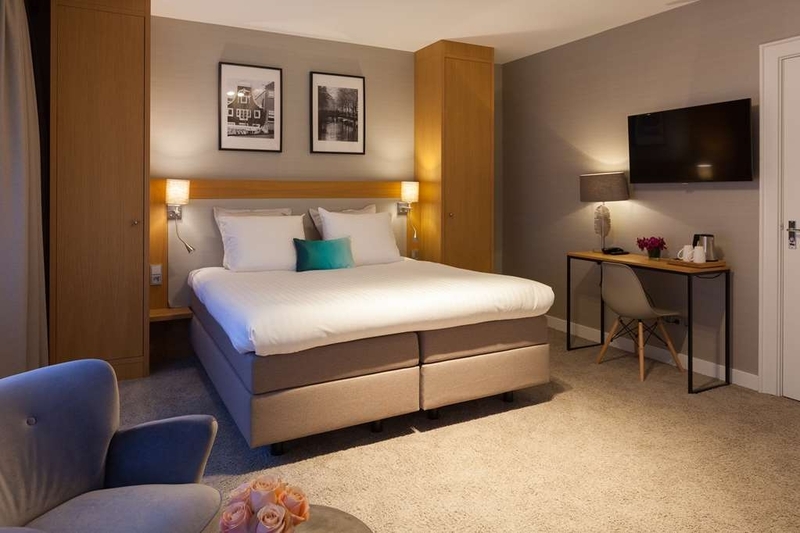 "One of my best stays ever"
We truly enjoyed our stay at the Delphi hotel. The friendliness and kind assistance of the staff was exceptional. If I visit Amsterdam again I will definitely stay there and I have been advising everyone I tell about my trip to stay at the Delphi hotel. The rooms are spacious, neat and the breakfast was outstanding. Best stay of my entire Europe trip. "Cannot say enough good things"
I cannot say enough good things about this hotel and the people that work there. My husband and I had the ability to spend four days in Amsterdam and we found this place at a great price. It isn't within walking distance of a lot of typical tourist attractions, but the neighborhood is lovely and quiet. It's only a block or two to restaurants, dunkin' donuts (for my US friends), and the train station. The hotel rooms are small, but efficient, and we had everything we needed. There was a lot of closet and drawer space, the bed was comfortable, and the water pressure was good too! The staff was great in giving us options/maps/ideas of places to go popular with tourists and locals. We had a hot breakfast in the hotel each day we stayed there. They have coffee and water available 24/7 - generally accompanied by fruit and dessert bread as well. A flight cancellation and some sub par airline customer service brought us back to the BW Delphi for another night and the staff directed us to a laundry mat. We used to business center to book a new flight home, and we think they might have given us a "nice" room because they felt bad for it. Regardless of whether they did or not, we had a great stay here and plan to stay again on a return trip! "Very nice staying with super professional and kind employees"
Loved staying at this hotel! This was a somewhat spur of the moment booking, but so glad we did. The staff are lovely, especially the waitress at breakfast, and the maids- so kind and accommodating. The breakfast itself was delicious. A range of good quality, satisfying options. Very impressive. Importantly, I really like the location. After having been slightly worried about how far out of the city it was, I was glad to hear of the easily accessible tram service. It was also quite nice to have a cosy retreat on the outer skirts, after exploring the snowy, bustling streets throughout the day. I very highly recommend this hotel- it ticks off all the boxes. P.S. The room size was perfect, so not a problem at all for us! "Smallest bed and room I have ever slept in"
This hotel is in a nice location and was convenient for a meeting. The room I had was warm and comfortable but was the smallest room and the smallest bed I have slept in outside of being on a boat. I am probably comparable to the average height of a Dutch woman and my head was against the wall and my feet against the wall. How an average Dutch man sleeps in that bed is beyond me. Breakfast was very good and the general hotel service efficient and friendly. "Wonderful hotel and amazing staff :)"
The hotel is in a calm, nice neighborhood where from both the city center or the RAI conference center is reachable by tram or bus relatively quickly and easily. The front desk staff was purely awesome, they were always very kind and helpful. The room itself was very tiny, there was no enough space to open the bathroom door entirely for example but I can understand that the country has limited amount of surface area thus every premises are much smaller in general. Unfortunately it was also quite dark too thus it would have not been that comfortable to stay in for a longer time I think. Everything was clean and well equipped though and the bed was very comfy and warm. The breakfast was superb, everything was good quality and delicious. Also complimentary coffee, tea, fruit and some sponge cakes were available all they at the lobby. A deposit needed to be paid for the hotel reservation and other costs too and then the actual price needed to be paid at the end again so prepare with the double amount on your bank account. The deposits were released some hours later after check-out. "Hidden Gem. Quiet, peaceful atmosphere, with excellent service!" Everyone, and I mean Everyone at the Front Desk was amazing. What an amazing group of people. The management was excellent, Fagni and Mimi - your whole staff was amazing, make sure to let them know how much we appreciated them. All the girls and the guys that worked the front desk were amazing! They were kind, they always smiled, they helped us figure out what to see and do. They were all beautiful, caring individuals that showed that they cared about us and about our enjoyment of their hotel, their city and their culture. What a hidden gem of a place. Nice quiet, peaceful atmosphere, with excellent service! Just outside the hustle and bustle of downtown, but a simple walk or 2 stops on the tram to be right in the thick of things. We were 5-10 minutes away from everything. Trams were cheap, so it was a great location to stay! The tram pass works on all transportation, and so we even took the bus a couple of times. Beds were amazing. We slept very well. We were there on vacation and loved every minute. Their breakfast was amazing, and a great way to start the day, but another thing we loved is their beverages in the evenings, they had teas, and warm drinks. I don't drink, but they also had spirits for those that enjoy them. I will definitely be back! "First time to Europe and outstanding experience"
My boyfriend and I stayed there from September 18 to 24. We had the greatest experience. This is a great hotel with great staff. I especially want to recognize Sharif and Jordi. You made our experience very memorable. Especially when Jordi went out of his way to find my boyfriend's phone, which he had lost outside the hotel. 15 minutes from Amsterdam Centraal by tram (5 & 24). Trams every 10 minutes. Very welcoming stay. Great nights sleep. Hot breakfast items replaced regularly, so available and hot, Great bread for bacon butties. Quality scrambled eggs. Nice quiet area, but easy to get to Dam Square and museum quarter and In De Wildeman. Great location. Excellent staff. Very comfortable beds and room in general. Great reccomendations of restaurants from staff. Great directions to transit and local shops from staff. Very friendly staff. Very good breakfast. Sheets were not changed and had to ask for sheets and make up bed myself. Great little hotel for a mid-week break to Amsterdam. For travellers, easy to reach from Zuid Amsterdam train station, a number 5 tram for 5 mins and a 5 minute walk. Only 10 minute walk to Rijksmuseum and Leidseplein area. Rooms are small, but functional. Staff are pleasant and willing to help. I had to print some vital work stuff whilst away, plus boarding passes and it was no problem. Highly recommended. "Exceeded our expectations in every way." Good for a European-style hotel (i.e., lacks fridge, microwave, A/C). Comfortable beds, reliable WIFI, good selection of breakfast foods, albeit at an extra charge (this seems to be the norm here). Very convenient to transit and in a nice part of town. Extraordinarily nice staff -- especially Shaerif (afternoon into evening shift). Feels much more like a boutique hotel than your standard Best Western. I stayed here for one night on business and to be honest it was just terrible. everything from the rude staff at the check in to the poor rooms. I am unsure how it is a 4* hotel! more like 2 or 3. for a similar price I should've stayed closer to the centre as well. I was extremely disappointed. Had mistake on the reservation date made by Priceline, the hotel has been refuse to modify or cancel it which result to waste time and 3 paid nights. For that reason I can say they will not show any hospitality when you stay in! Expect the unexpected. Upon check out additional fees were added to my bill which had not been mentioned upon check in. It felt that this hotel could not be trusted. This hotel did not give loyalty card points for staying at Best Western Hotels. "Decent lodgings in a nice area"
The check in went very well and the staff member at the desk was very welcoming. The room was conveniently on the ground floor, however there was a bit of early morning noise from other residents in the area. We chuckled as we settled in for our first night's sleep...the "double" bed was two single mattresses set on a large foundation. The mattresses kept creeping apart and one of us was in the gap between. Not a problem, but worth mentioning. We were surprised at the cost of the in house breakfast so we wandered down to the museum square and ate for less than half what the hotel charged. All in all it was a good stay. "Nice hotel, great value, quiet location"
Clean, comfortable, nicely decorated room. Pleasant staff. Awesom breakfast buffet. Great location in a nice quiet neighborhood away from the crowded touristy areas. But close enough that its easy to get to city center on the tram which is just a block from the hotel. Restaurants, bars, grocery, coffee just around the corner. Nice greenspace esplanade in front of the hotel, spanning several blocks, currently hosting ARTZUID outdoor sculpture exhibiton. The hotel is decorated very nice and appears to be recently updated. The staff was very friendly and helpful with getting food having arrived late. Everything was very clean and the bed was so comfortable. Only con is the size of the rooms were VERY small and had just enough room to move around bed and that's about it. Wanna feel like home and in the same time abroad? This is your answer. Friendly stuff, multi language, great hospitality, close to all your needs, this hotel offers you what you are looking for. Great experience and a very big like. Ps: thank you Jordy you are the best . "Perfect room in a well located small hotel!" The bright, very spacious room with a king size bed and armed chair in a corner overlooking a tree lined street was so perfect I thought I was upgraded. They provided soap and shampoo but you have to bring your own body lotion and conditioner. The hotel is small with a small reception area and a dining room with a kitchen on the first floor. Complementary tea, coffee, fruits and pastries (leftover from breakfast) are pleasant snacks in the afternoon. Best Western Delphi is located one block from a commercial street with a well stocked supermarket, boutiques, pharmacies, coffee houses, ice cream shops, and restaurants ( I had the best Chinese food at a restaurant 2 blocks away). The Amsterdam museum complex is a 10/15 minute walk away. Buses and trams run daily down the commercial street from Central Station or the Airport. Coming to Amsterdam by train, you can easily catch the #5 or #24 and get off one block away from the hotel, or coming by plane, you can catch the #197 Airport bus with connection to #24. The room had no AC. and can be quite unpleasant even with the breeze coming from the two large windows. I thought I had an upgrade because ORBITZ charged me more than the advertised rate. It was a bait and switch that ORBITZ pulled on me and it was not cool. Well done renovated building with clean details and decorations. Located about 15 minute walk from museum. The hotel provides free bikes, the popular way to travel Amsterdam. Very good hot breakfast with fresh breads, meats, eggs. Cut fruit isn't the best. Ask for a room with a balcony. ACCESSIBLE: Step to enter hotel; step into bathroom. "Visiting from Vancouver Canada "
A nice hotel on a direct tram route to Amsterdam . Hotel is small with very small bedrooms ,we could hardly move in ours once we got the cases open , big comfy bed took up most of the room . Nice breakfast room and good selection of food tea and coffee available all day and cake and fruit also. Shopping area close by with a few restaurants nearby. 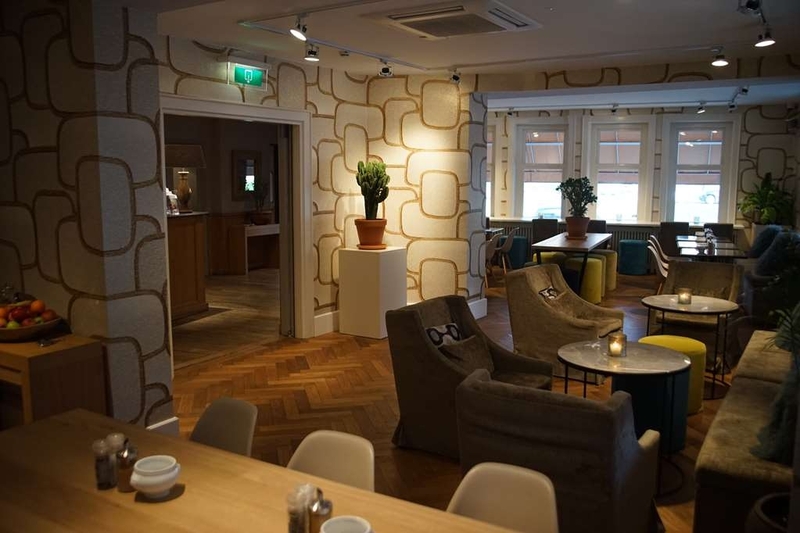 This lovely hotel is in a quiet neighborhood of Amsterdam about halfway between the airport and city center. The employees here are truly wonderful. Polite, funny, helpful and just delightful. The breakfast bar had a great variety of food and the coffee was nice and strong. The rooms are small like a typical European hotel but super clean and comfortable. Lovely! "Outside the centre but good transport links"
A small hotel near the No. 5 tram (easy to get to centre) with a couple of restaurants and cafes, plus a supermarket nearby. Beds were very comfy, and we had a quiet room with balcony overlooking some back gardens with mature trees. Staff were very pleasant. When we reported we didn't have any bedside lights, this was remedied promptly. The bin in the bathroom hadn't been emptied prior to our arrival, but this was also dealt with. For me, the breakfast was exceptional, with a great selection of cold meats and cheeses, including a wonderful, thinly sliced peppered beef. Plus eggs, bacon, mushrooms, sausages, potatoes, lovely bread/croissant, fresh fruit, yoghourt cereal and self-serve coffee. However, the breakfast room is rather small for the size of hotel. I had to share a table, which was not a problem, but it was rather cramped. Wifi worked well. We left our cases on the last day until about 5pm, and spent the last hour in the breakfast room chilling out and drinking tea/coffee. All in all a very good experience. All problems were minor and dealt with promptly and with great attitude. "Not sure how award for star is made"
for me this was a terrible hotel, very expensive for the smallest room I have ever had the displeasure of booking, I booked a single room, I knew it would be small but this was taking small to a whole new level. The bathroom was so small that when using the toilet, your knees would be under the sink, to get in to the shower you had to shuffle past the sink. The TV was small (Lilliputian) as you would expect with reception that was so bad I didn't bother to watch. Carpet was stained, bed shoved between three walls, this made the feel uncomfortable and cramped, it was like staying in an old fashioned sleeper car on a railroad. No mini bar, in a four star hotel, unreal. I have no idea how the rating was given to this accommodation, the picture certainly give a different and in my opinion a deceptive view of the hotel, I have stayed in many and this is certainly not deserving of the standard I would expect for this rating, at best I wold suggest two. I will not be staying here again, I have used many best western over the years in both the UK and overseas but this was by far the one that I will always remember, but for all the wrong reasons. As for the staff, mixed reviews, some were fantastic others had an attitude that you would expect from an adolescent child. "Small Western and not Best Western"
I booked the room lately for me and my wife. An advantage is: The Loacation is near by a tram. But: The Room was small, The Bathroom is too small. The Toilette is too near at the wall A bad relation between value and price. I never visit the House a second time. I was travelling on business, but I would take my family to this hotel. Great location, easy walking distance from the 'south' station, 10-15 walk to the museum area. Great pubs and restaurants nearby. 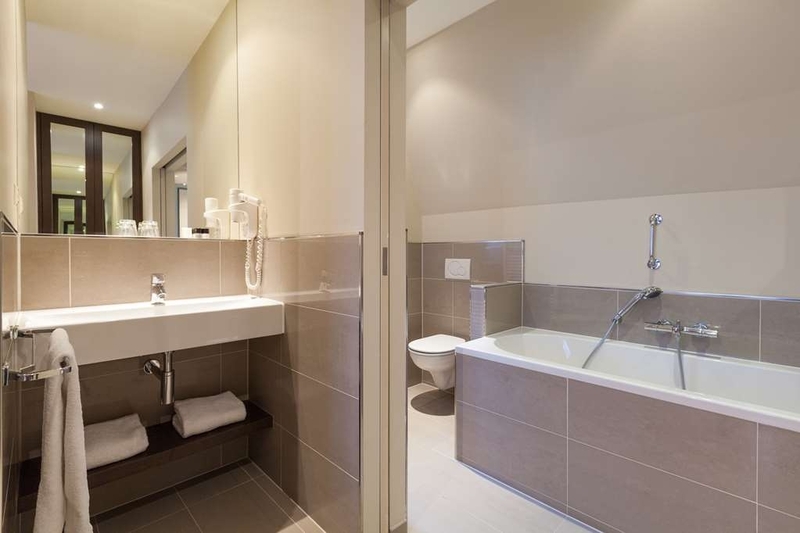 The rooms have enough space that you don't fall over your bags, windows that work and nice modern clean bathrooms. We had a great stay here. It was a bit far from the city center, but it made for a nice walk everyday. It was only about 20 minutes from the Rijksmuseum, and only about 20 minutes from the train station. Overall a pretty decent location. The people at the front desk were nice, we rented bikes from them one day and it was pretty fun (also convenient that we could just rent them right there). The cleaning staff was great, the room was perfect just to sleep, change and get ready. My only quam was the bed. We were supposed to get a queen size bed, instead we got 2 twins pushed together. Keep in mind, they didn't stay together, but we made do. This hotel is a little out of town, but we wanted the walking experience. Everywhere from Van Gogh museum to the centre of town is very walkable. The hotel staff were extremely helpful. Coffee and cake available all day. Good quality and selection of breakfast options. The position of this hotel was quite handy as it was just round the corner from a lot of tram stops to reach almost anywhere. it was quiet, clean and friendly. you could pay extra for breakfast. there was a good choice and very reasonably priced. Lots of guests took this choice, including us. So it was obviously very popular. the rooms were basic but clean and comfy. 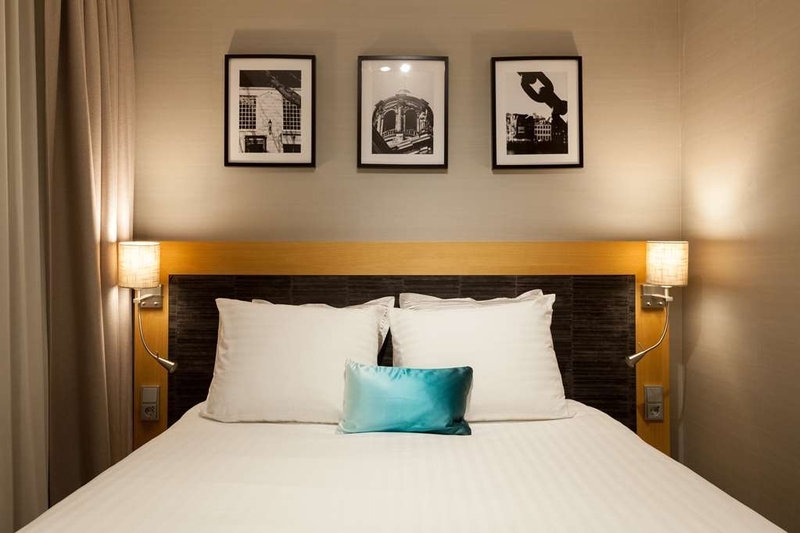 "Lovely hotel lovely location "
This hotel is conveniently located near shops & transportation however it's also in a quite residential area which I loved! Hotel staff were very friendly and helpful especially a man who work during the night on Sunday 6th Nov & Monday 7th Nov he was the most helpful member of staff through whole hotel. He really made our stay special! Overall my stay was great & the breakfast was good very filling & the complimentary drink through the day was also great! I cannot thank the staff enough for all there help each day giving me maps and directions to where I wanted to go for the day. I would definitely stay at this hotel again. We were impressed with the hotel. They had great breakfasts and fabulous staff. There were just a few glitches in our room that probably could be fixed. The electrical outlets to plug in the adaptor were pretty skimpy because they were surge protectors which didn't quite keep it plugged in. The drapes on the windows were so long that it overwhelmed the room. Otherwise, it was a pleasant stay. The staff helped us with transportation and even made suggestions about using the public transportation with day passes, which was great for us.They helped us with the bus tour to the windmills, etc. Good choice for visitors of events in RAI Amsterdam - good location 10-15 minutes by foot from RAI, comfortable room, hospitable personel. Breakfast was also as expected, so I had good expression of spending there 5 days during my business trip. It was the worst 4-start hotel I have ever stayed at and I don't know how it is considered to be 4-star. Except for the stained carpet, the room itself was okay, not too small, with a large wall mirror, vanity table, armchair and two decent size wardrobe.It looked clean. There was no fridge and the double bed was actually two, I suppose, twin beds stuck together. My main problem was with the bathroom. It was supposedly cleaned before we checked in but yet there was hair on the shower walls and the floor was stained. It was very small and smelly; the fan was loud and noisy. The shower curtain was stained and gross; towels were extremely thin and face towels were almost touching the toilet. The quality of sleep is not that great. There was a lot of thumping as if people were wearing Dutch Clogs! Wi-Fi was kind of flaky and slow. The hotel is a bit far from the core area but still close to a nice waterway and public transit. Check in and check out was handled by a delightful,extremely competent young lady, who spoke excellent English. Room was of reasonable size and was well appointed, however the lift was small and could best be described as "classic" with an outward opening door. Breakfast was excellent, consisting of scrambled or hard boiled eggs, fruit, cereal, yoghurt, cheeses, cold cuts, breads and croissants, fresh juices, bacon and mini sausages, all well prepared with the dining room serviced by another extremely competent young lady. The hotel is situated near a quiet tree lined street which is easily reached by public trams. In no way is this property flash or pretentious, however it is extremely affordable with excellent features including competent helpful staff. We stayed here for 1 night. Nice and clean room. The stairway and public restroom gives you the idea it's going to be a small room, but our room was very spacious! Front desk receptionist very friendly and helpful speaking various languages. We could ask about activities and buy tickets for museums right at the front desk. Great services, great hotel. I stayed in this hotel during a business trip and I found it very comfortable with nice and helpful staff. My room was quiet, medium size and very clean with everything I needed. The location is not far from the city centre and well connected with public transport. Lovely neighborhood hotel that makes you feel at home. Room was very large, clean, and tastefully decorated. 3rd floor facing the street with huge windows extending the length of the room that looked at beautiful trees. Was not too noisy for me. Bathroom had a big clean soaking tub as well. Loved the neighborhood, away from the centre but close enough with plenty of streets lined with local restaurants and shops, and tram-stops nearby. It's a value hotel that exceeded my expectations. Stayed in room 120 , the back of the hotel, no day light , kitchen noisy in the morning from 6.45am. This hotel is in a residential area. There is a good restaurant Fidelio not far away. I would not stay here again. "Noisy rooms but very helpful staff"
When we visited the hotel (March 2016) they were going through some renovation process. The first night we could't sleep at all as the air conditioner was incredibly loud. We informed the staff but they were full and we couldn't get a reallocation. The next day they put us on a new room on an upper floor that was way better. It was also my partner´s birthday and they accommodated for a birthday cake and breakfast in bed at a really good rate. However, the default breakfast wasn't very impressive. Overall it was a nice hotel with good connection to the city centre. Clean rooms and hotel, friendly staff, just outside of the centre but within walking distance and near a number of tram stops. Free coffee/tea/water/cake all day and night. We travel to Amsterdam 3/4 times a year and would definitely stay here again. "An excellent place to stay." The Delphi is a relatively small hotel in a quiet location by a minor road alongside an attractive double avenue of mature trees. The hotel staff were all very friendly and looked after my wife and myself very well. Although we had our car parked right outside the hotel we chose not to use it for our entire two night stay, prefering to walk into the city or go on the tram, for which there was a stop closeby. Whether we walked or went by tram we were able to get to wherever we wanted to go in just a few minutes. We had a good ensuite room with balcony overlooking pretty enclosed residential gardens to the side/rear of the hotel. We shall definitely stay at the Delphi again whenever we are in Amsterdam. We spent 4 days in Amsterdam on our way to Spain and very much enjoyed our stay here. We picked the hotel, in part because of the Trip Advisor reviews and partially because I was able to book with travel miles. We booked a Suite, which was on the top floor (4). The room was note as large as a North American suite, but was large and comfortable. The beds are very very comfortable. I have no complaints at all. When we checked in a noon, our room had just been vacated and normally we would have to wait until 3 to check in. Since we had just travelled for 12 hours, they rushed our room and we only had to wait half an hour. I recommend this hotel. We stayed for a long weekend. The hotel is in a very quite and location which lets you breath in real residents life. Very close to Museum Quarter. The hotel is well presented, real wi-fi and all the services that you might require if you stay for a city break. The most exceptional characteristic it's the great hospitality and great staff. Customer service is excellent and they are all so helpful in helping you booking all different activities. A special thanks to the night receptionist who helped us to get Anne Frank House tickets. It's very difficult to get the tickets as they are all sold out. He explained that in the evening they release certain slots but you need to check the web-site constantly. As we just got back to the hotel, we went to our room not to excited about the possibility that we wouldn't be going. After 20 minutes, he called our room to let us know that tickets were now available and we could have use the pc available for guests! Quiet location yet easy to get to centre of Amsterdam, approx. 15 mins on nearby tram. Not many bars/restaurants nearby, Breakfast very good, with free coffee and cake available all day. Great staff speaking good English. Will use hotel again. "A convenient and comfortable hotel"
My husband and I really enjoyed our stay. The rooms were furnished to a very high standard and the hotel was well located. It was 10 minutes from the museum district and easily reached by tram. There are many lovely restaurants and cafes in the immediate area. The rooms were well furnished and the hotel provided free tea, coffee and cake throughout the day! The breakfast was quite expensive but was filling and there was a nice range of food. 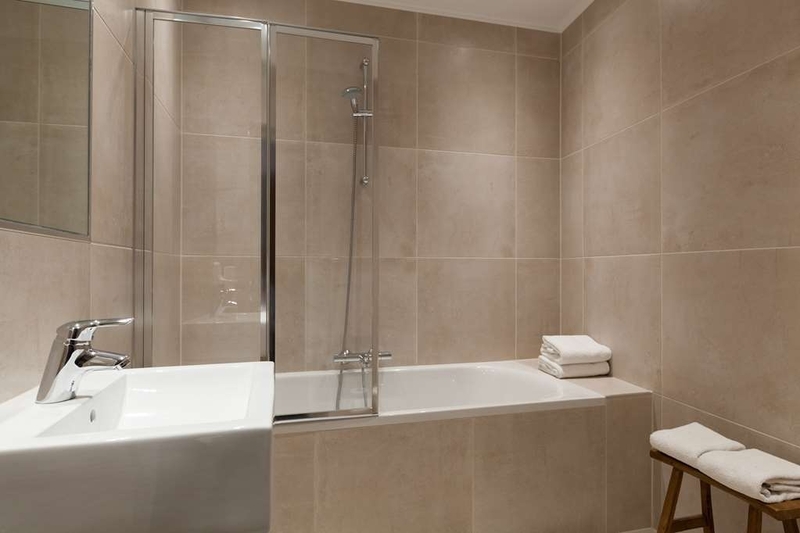 "A lovely hotel in a great area"
The hotel has been renovated to a very high standard. It is well located, and is approximately 10 minutes walk from the museum district. There are lovely restaurants and cafes close by. The rooms are well furnished and we have a balcony, which was a nice bonus. Tea, coffee and cake are available for free! Breakfast is a little expensive, but filling, with a wide range of food available. My wife and I stayed at this hotel while visiting Amsterdam. Clean, comfortable and a great breakfast. Complimentary coffee and cakes throughout the day. Although a distance from the centre of town the trams run regularly from one hundred metres away. Buy a travel pass for the duration of your stay - it saves any hassle. Overall I would happily go back. nice hotel in a great location. just out of city centre. walking distance to museum square,shops, park, restuarants etc. room was nice,although bed light did not work,safety box did not work,no-where to put toilettries once inside shower. Have been in better 4 star hotels. Attitude of one female member of staff was terrible at breakfast time. made to feel bad just because there was no milk. improvements need to be made before we consider returning. We were upgraded to a very nice, modern superior room on the 4th floor. Breakfast was good with plenty of choice of hot and cold items. A dark haired lady guarded the spare cutlery behind the counter as if it was precious though! Very strange that everything was self service but the cutlery wasn't. Her manner was quite abrupt. Apart from that all other staff we encountered were pleasant and the reception staff were always helpful. Tram stop for line 5 just around the corner on a nice, quiet shopping street. Could walk to museum area in around 15 minutes. 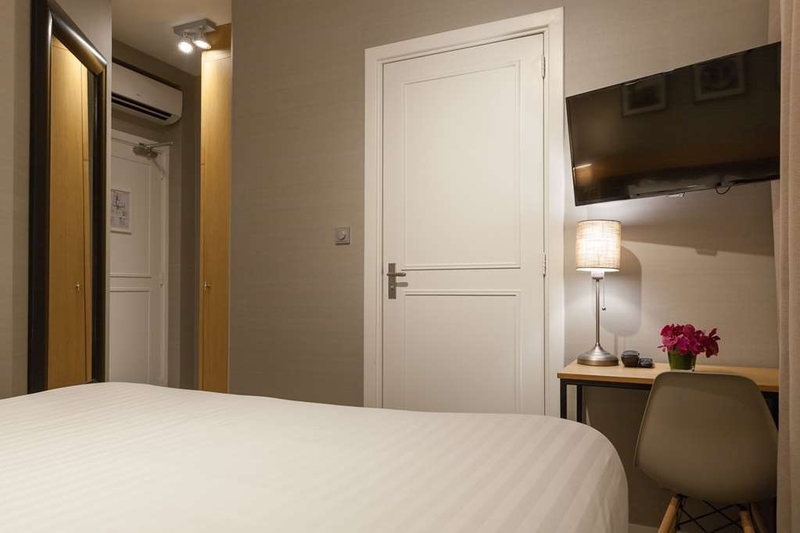 "Pleasant Hotel in quiet area within a tram drive to the City"
Smart and tidy small hotel with pleasant staff and smart clean comfortable rooms. 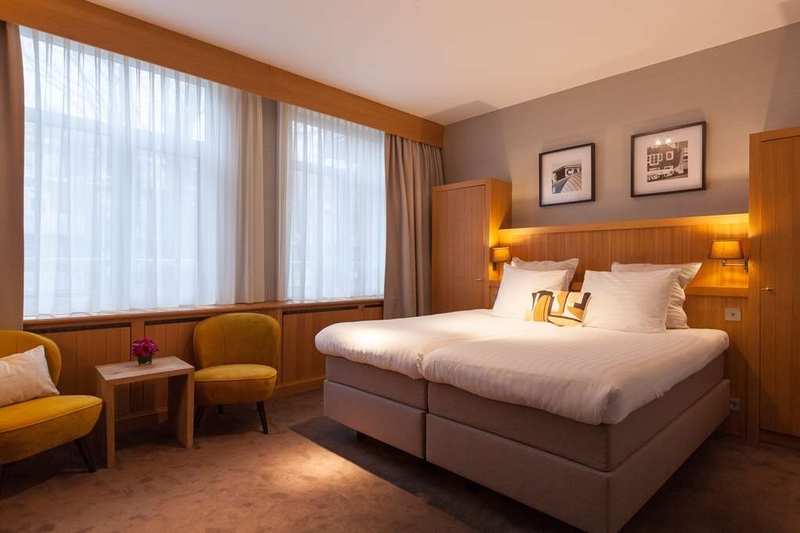 The beauty of this hotel is that it is outside Amsterdam centre but walking distance ti the park and the centre, Its great to walk round and visit the market and different areasm and if you get tired get a tram back its only two minutes from the hotel. "Nice location, average facilities, great staff"
The hotel is located in a nice area with nearby shops and restaurants. It is near to Van Gogh museum. There is a nearby Tram station that connects you to the city center. The internet is good, The staff are nice and really helpful. The hotel has average facilities. The ward robe is not a real one, the bathroom is so tight and the bed and pillows are not comfortable. There is no AC. I understood it is available in a few rooms only, so be careful in a hot day. We really appreciated this quiet, tastefully decorated small hotel walking distance from RAI and the museum quarter. Refreshments available and breakfast met our requirements. Wi-fi free and helpful staff. Best western was a quaint hotel. The room I had was spacious, comfortable and clean with a lovely view of the square. The lounge/dining area was a lovely place to sit, unwind and a good place to wait for others. You were able to have fresh fruit, coffee/tea and cake for free throughout the day. The hotel was Located in a lovely area with The trams on the next road, which took you straight into town. The only downfall I would say was there tended to be a lot of banging, wasn't sure whether it came from the floor above us ( I was on floor 3) or next to us....was quite disturbing during the day, thankfully it didn't happen at night. "Nothing grand but simple, clean and easy access to RAI"
While the room may have felt small, it was regular sized by Amsterdam standards. It was not a modern or luxurious hotel, it was clean and well kept. The hotel was very quiet. I had a court yard room that with a nice balcony. I enjoyed being able to open the windows. The staff was nice and helpful in navigating the city. I was able to buy team tickets from the front desk. I enjoyed the water and cake that was available all day in the Cafe area. Location is great if you want something quiet, near RAI and/or easy access to the airport. RAI was a 20 minute walk or I grabbed the team for two stops in the rain then walked across the park. Not a ton of food options nearby. I find a few bakeries for breakfast and took the tram to eat dinner in/and explore other parts of the city. "Good standing, calm and very convenient"
Modern decoration, good standing. Nice and modern rooms. All day free refreshment and coffee in the lobby. Free wifi. 15 min walk from the museum place and all tram/bus facilities. Renting bikes from the hotel really makes it easy. Air condition and modern bathroom. Rooms at the back at particularly quiet. I recommend. "if you have luggage, better not to"
to get on the elevator you need to open the heavy door, even you are off the elevator you need to use stairs and open many doors... if you have luggage, better not to choose here. the only nice part is the enviroment. I stayed at this hotel for 6 nights in early May. It is in a quiet part of town but within easy reach of downtown by tram. Two tram lines run within 150 meters of hotel. The rooms are clean and airy. Breakfast was better than expected for a European hotel and in the lounge area tea and coffee are available 24/7. The whole place has a family friendly atmosphere. The staff always friendly and willing to help out. "Good option for access to exhibitions at RAI"
I ´ve stay there for 2 nights. Stuff very kindfull, room quite big and clean. What was missing - some night bar. There was no possibility to have some drinks in the evening. Closest pub is 1 or 2 tram stops away. Location is quiet with parking possibilities around. Breakfast very good, hot and cold kitchen. For just sleeping (and all day stayed outside hotel) is a good choice for a good price. We have stayed here on numerous occasions and have always found the accommodation and pricing reasonable and the staff professional and accommodating. On this occasion I have to say all considerations were the worst we have encountered. The accommodation was very small for a superior room even though we booked months in advance and was told the hotel was booked and there wasn't a consideration for moving to another room. The price was considerably higher than normal and the difference in staying an extra day would have been 40% which seemed extraordinary for what we received in the first place. The staff were mostly unapologetic and when we asked about the room size, state of the room upon our arrival ( not cleaned and arranged by any standards) and the fact that there weren't sufficient towels or a phone or television that worked or instructions for either we received a very subpar and dismissive attitude. In the end we are still here ( we only stayed two nights) and will leave back home to Canada tomorrow. We did finally receive towels but I had to ask twice for them. For our trouble we received breakfast for our stay but when we approached the staff the next day about the phone and Accomodations they said we should have come sooner to speak with them as they could accommodate a room change even though they told us previously they couldn't. They said for the hassle they would throw in breakfast to which I replied Your colleague already did or wasn't this passed on? I hope we don't end up being charged for this. Considering I paid for this room months ago. The phone was never fixed and no explanation was given . We asked them to call for a cab for us to return to the airport and they said they had their own service and we were welcome to call ourselves to which I replied, that would be great if we had a phone that worked. We ended up using the front desk phone. We have stayed here enough times to understand the difference between North American and European standards and are accepting of that . What I don't expect or accept is poor attitude, poor service and low standards. We have always stayed here due to its location and proximity to beautiful shops and scenery but will not be returning. We have stayed in North American Best Westerns and have received service that has far surpassed that which we received this time. We are very disappointed and hope they will change back to their previous level of service. Stayed at this hotel 4/16/16 for two nights. Great location, hotel was Awesome as was the staff, breakfast was also very good and plenty to Choose fro to start your day. Our room was great, 1st floor, bigger Than I expected. Would highly recommend staying here, easy access To trams which we used during our stay and a very cute neighborhood, Felt very safe. Would definitely stay here again. I enjoyed staying here during the summer of 2015, it was one of the most pleasant hotels I have ever been to. The hotel offers free wifi, and complementary coffee or tea while you stay in the bar. It's located just outside the city which provides the peace and serenity I need when going on a holiday. It's easy to get to by public transport as we took the light rail/tram to get there. The service was very helpful en friendly. Location is decent within a pleasant residential area, all amenities close by! Hit and miss with taxi prices into amsterdam central, one day 15 euros the next day 25, best to take the tram which is a 5 minute walk away. Room was clean and pleasant, the only issue was bathroom door handle and lock were broken but it wasn't a huge problem. Walls are thin so you can hear the neighbours.Keep in mind the city tax of 5 euro pp per night payable on checkout. "Very nice hotel in a quiet residential neighborhood"
My husband and I were very happy with our four day stay at this hotel. The staff was knowlegable, helpful and friendly and the map they gave us of the city was wonderful and easy to follow. There were plenty of tables and chairs for everyone in the breakfast room. The breakfast was quite good. There were eggs, bacon, sausage, pancakes, cheese, cold cuts, several breads, croissants and muffins as well as yogurt and fruit, juices, coffee and tea. The woman who oversaw the meal was continually refilling everything and clearing tables. Coffee, tea and some cake or muffins were available all day long, which was a nice touch when we returned from sightseeing. The hotel was in a very quiet nieghborhood, but only one block from several stores and two short blocks from the closest tram stop. The trams in Amsterdam run continuously and are quite clean. You can buy your tickets right on the tram, and also in the hotel , which we did, and charge them to the room. To save money be sure to purchase tickets for 24 hours or 48 hours instead of individual tickets per trip. The only catch is you must swipe the ticket when you get on the tram and also as you leave the tram. (You will see everyone doing just that) We bought a three day pass and took the tram to the museums, the train station, the canals and other parts of the city. It was very easy to do and we never waited more than ten minutes at any stop. The furniture in our room was older, but everything was very clean. We loved the hand pulled curtains because they completely kept out the morning sun light. We had a European King, which is two twins pushed together, that was clean and comfortable. We found extra pillows in the closet. Every day we received fresh towels and toiletries. It was also possible to rent a bicycle from the hotel. The staff recomended two restaurants for dinner (Gauchos for steak and a local Pizzeria) and both were excellent choices. We inquired about a taxi to the airport, and the staff made the arrangements . The taxi showed up on time and we were charged a reasonable 37 Euros for the trip. This hotel is not fancy or luxurious. But it is clean, quiet, comfortable and in a safe neighborhood location and fit the bill perfectly for us. After the hustle and bustle of the city, it was nice to take the tram back to our home away from home. Ok this isn't going to be the most fancy hotel you have ever stayed. However, the rooms are comfortable and clean. The location near a major tram line is another highlight. Breakfast is great with a good continental spread offered. I would recommend this hotel for people who would be out all day and just need w comfortable bed a night. It's only a few tram stops away from the city and its in a good residential area of Amsterdam. "High price for low standards & quality "
Worn out & ripped off is how the hotel is & how I felt after a stay here! Resonable welcoming once I entered the hotel & instructions for getting to the room. However upon reaching the room I couldn't get over the size of this room. Small & overly compact. I have stayed in larger hostels. The bed was across the window with a small side table next to a desk & chair. A large wardrobe oddly placed against a wall with small tv. Ensuite was clean & seemed recently renovated. To close the curtains by the old draughty windows I had to stand on the bed. The bed was a small single, not what I had been led to believe I would have. The ill fitting sheets & low tog duvet made for a very cold night, no extra bedding available in the large wardrobe. Then in the morning I noticed the stains on the furniture & floor & dread to think what I have just slept in! Breakfast is self service buffet with what looked like raw sausage over cooked bacon & plastic eggs. I did eat the croissants & had some treacle like coffee. I don't complain & normally (to my wife's annoyance) find a positive in any case I can but simply cannot find one for this hotel. Upon checking out the ladies at the desk were pleasant but not once asked about my stay simply wanted payment which had already been taken from my account. Since arriving home I have contacted the agency with whom I booked the stay, the hotel directly & the group under whom the hotel operates. Only the hotel has not replied to either me or its parent group which I have email confirmation of. The agency has now taken the hotel off their list until such time the hotel comes up to an acceptable standard. The parent group, Best Western, in fairness has agreed to send a small €20 voucher to me. My stay cost €125 for 1 night. My advice would be to stay clear of this premises for the foreseeable future as they need to put in some serious work all round. High price for low standards & no quality. 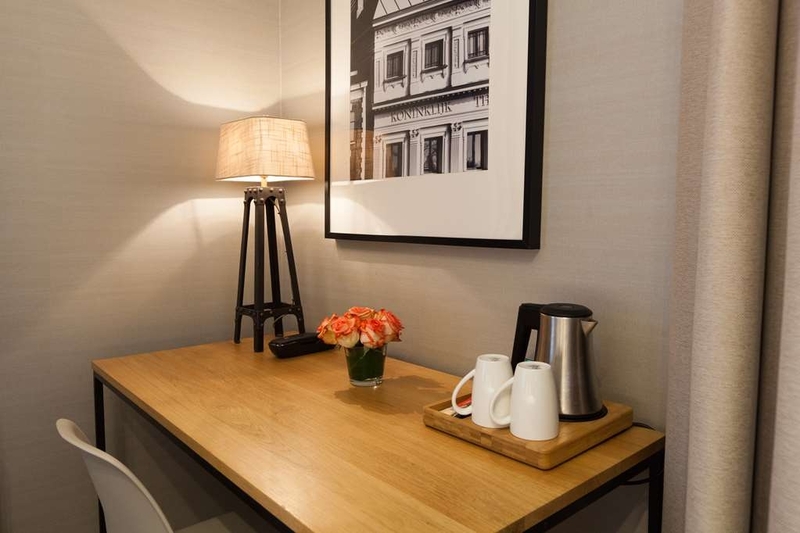 "A great hotel with good connections to the centre!" If you are coming from the airport you can hop on two trains to get to the hotel. It isn't that difficult as it sounds though you have to get used to the checking in and out of the trams. The hotel can be easily found. The staff is friendly and the rooms are good too, though a few essential things are missing (coat hangers,...). In the five days we spent there we had a peaceful stay. The free coffee and tea downstairs was always refreshing in the morning. Bicycles can also be rented from the hotel. Overall the hotel is a nice place for a holiday in Amsterdam, since it isn't situated in the centre or in the outskirts so you can get everywhere in under an hour with public transport. The rooms are cramped with miniature toilet. That will be the first impression we have on entering. The front desk people are cheerful and helpful. But on last day they didn't warn us and by the time we reach hotel by afternoon 3 pm our bags and dresses were in the lobby citing 12 noon check out. Breakfast was complimentary and decent. Best part is 24 hours complimentary self prepared coffee or tea available in the restaurant. It is also walkable to tram station. You can hire bicycle as well from the hotel. I stayed in the 2nd floor...the overall room and place is nice...the location is good close to the tram...but I think that the floors are made of wood and so everything was wobbly and I can hear footsteps of people on the upper floor or same floor...other than that everything was perfect...and the complimentary cakes is awesome ?? This place has slipped big time since I was here in October. For starters, most of the first and second floors are under construction. When I entered my room, it had no electricity and workmen next door were using a jackhammer on the common wall. If I had stayed in that room, I would have needed ear protection like the kind worn on US carriers and all my fillings would have fallen out. It was so ludicrous it was actually funny in a Monty Python way. The breakfast, which used to be very good, is now borderline pathetic. Rubber scrambled eggs anyone? When I was here before, a highly-competent woman was taking care of the breakfast full time. Now the front desk attendant does it between phone calls and checkins and outs. I'm shocked by how far and fast a place can fall. It's a good thing they cannot affect the location. "Did not provide notice of major construction before booking"
This felt dishonest to me. There was no notice of the fact that the 2nd floor would be under construction and that noise from 10am - 4pm was so loud I couldn't do work or sleep in my room. And this after 12 hour journey. "Excellent hotel, friendly, helpful staff"
A very clean and comfortable hotel, we had room 487 which suited us as it was at the back of the hotel so very quiet, a minor problem was that the walls are very thin and we could hear people next door and below us, fortunately it's mostly couples or business men here so the sounds were restricted to people getting ready in the morning or going to bed. Our room was quite cramped due to an unnecessary large easy chair at the table which we had to keep moving to reach the heater controls, a dining chair would have been more useful as there was another comfy chair in the room. Their was also only one shelf in the wardrobe to put clothes on. The bed was very comfortable, pillows a bit lumpy, but you never get a pillow like your own. We looked at an unoccupied room when it was being cleaned and it was really nice, huge with a a small table and two chairs. The breakfast was really good, different breads,a toaster, scrambled or boiled eggs, bacon, sausage, cold meats,cheese. We loved the dining room it was very informal, like a cafe, settees at one end with informative magazines and books about Amsterdam. You would feel comfortable sitting their at any time. One highlight was the free diverse teas, coffee, hot chocolate and cake all day. The best thing about this hotel was the friendliness and helpfulness of all the staff, we felt that they would try to solve any problem. We were in Amsterdam for 4 nights and bought a 4 day unlimited tram/ bus ticket for 21e. Well worth it to get to different areas. If you get the 197 airport bus straight to various stops in Amsterdam this is included in the ticket. 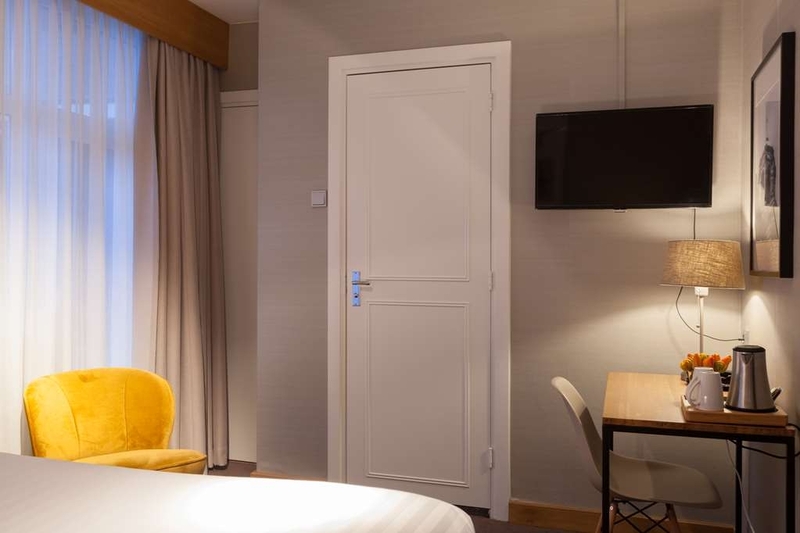 "Friendly, nice and quiet hotel, perfect for a getaway weekend"
A very nice hotel just a short tram ride away from the Museum square and 2 direct lines to the city center. We booked a suite for 2 nights, and enjoyed a very nice and modern room with beautiful fresh flowers. Breakfast was very good, a smaller buffet with various cereals, juices, scrambled eggs and bacon, very nice and solid, so we didn't had to have lunch until later in the afternoon. The hotel was situated a bit outside of the hectic and noisy streets, so it was a nice and quiet place to withdraw to after a long day in downtown, not recommended for partypeople though, as it is situated in a residential area with not many bars in the neighborhood. Recommended to take the train from Schiphol Airport to Amsterdam Zuid and hop on the tram #5, and get off at Gerrit van der Veenstraat and walk a block, it was just 30 minutes in total from the Airport. Also recommended to buy day-tickets for public transportation so that one could easily hop on the tram to the hotel after a long day of walking around the city. We bought them at the airport so that they included the train ticket as well. Very friendly staff at all hours. The only unfortunate part was that our room (4th floor) was freezingly cold when we arrived at 7PM, and although we set the heater on at max and return to the hotel at 11PM, the room was still really cold that we had the request extra blankets at 1AM. The staff kindly gave us extra blankets and checked if we had turned the heating on, and we were ok, but as we had sent extra confirmation to the hotel as to when we are approximately arriving in the evening, it would have been nice if they could have turned on the heat already earlier. The room was at the top floor and probably hadn't been in use for a while during the winter, and needed half a day to heat up. Fully recommended small hotel, it was not a luxury hotel nor budget, but a perfect in-between. "Nice but not 4 stars"
The hotel is located at 10 minutes tram ride from Amsterdam city centre (and only half an hour from the Airport with public transport), tram 5 and 24 stop almost in front of the hotel, a very good position. The room and the bathroom were clean but not very big, from a 4 stars I expected something much, however the biggest problem was the "old shoes" smell that hit you as soon as you opened the room's door whose responsible, I suppose, was the carpet, that definitely needed to be washed. I know that covering the floor with carpet is very used in nordic countries but I would suggest to change this habit as not very hygienic, or at least wash it more often! Another problem was that the room was a definitely cold and it was not possible to increase the heating. Mattresses are definitely too soft. Anyway the breakfast was abundant and refilled until close hour (10:30) and the staff was really friendly and helpful. The hotel is located in a residential neighborhood.Tram stop is very close by and also a "shooping street" with various shops, cafés and supermarket. The hotel had friendly staff and every morning the cleaning lady was very eager to clean our room with a big smile.The room was nice and quiet at least with windows closed during the night.Breakfast was basic,but still delicate with warm and cold options. Major museums are close by and can be reached either by tram or by foot. The hotel is not suitable if you are in Amsterdam to party as there is little public transport in the middle of night. We would stay here again.Nice to be able to relax in a quiet place after a busy day in the city centre. "A hidden gem of a place"
I have stayed at this BW five times in the last two months, here are my findings: - Each room is different from the other, it used to be a private home, so it is not a cookie-cutter hotel. They are in the process of remodeling, some of the rooms still feel like you're a guest in a room from the 1900s, others feel contemporary; - The double occupancy rooms are very spacious, some have showers, others have a bathtub/shower combo; - You won't get much natural light in most rooms, you're either facing the street and have to close your curtains for privacy, or the rooms don't draw in light well; - Beds are two single beds put together; - The neighborhood is extremely residential, but trams around the corner take you to the train towards to the airport (and elsewhere in NL) in 5 minutes or to the City Center (other direction) in anywhere from 10-20 minutes, depending on where you're going; - TVs are small and old but have English language programs (the Dutch don't do voiceovers like other countries) - tv replacement is one of the few areas for improvement for the hotel; - Breakfast is decent, including scrambled eggs, bacon, sausage and other cold options/croissants/breads, etc. I would suggest trying it once before you commit to having it for all the days you're there; - Wifi works well and is fast; - There are two outlets on opposite sides of the bed; - There are cool magazines about Amsterdam in the room, as well as minicards with discounts for attractions in town (the Los Pilones free shot, Lobster and Burger discount and Hard Rock happy hour notification are good ones!) They seem to offer numerous discounts for stays there, so check the internet to see if you can find a better price than what's on the usual sites. "Now stayed here twice. Lovely hotel. Very helpful reception staff. 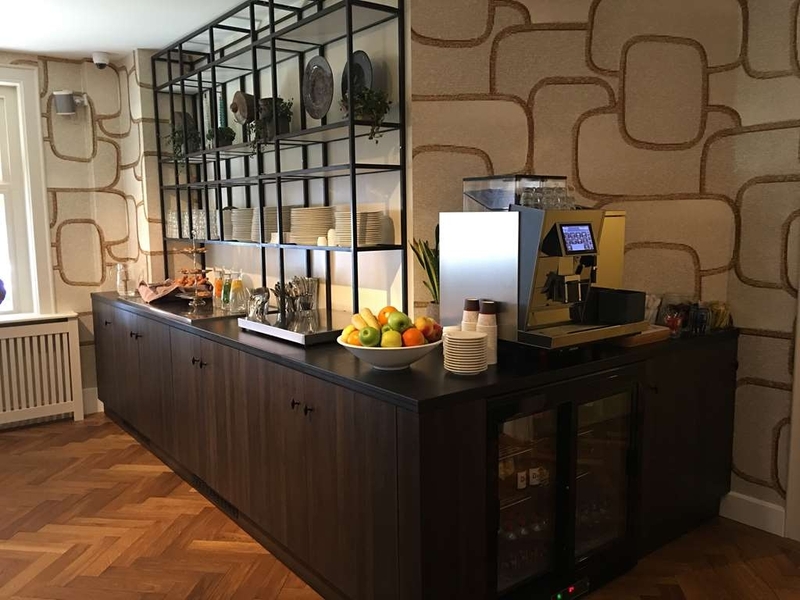 Free coffee machine is a great touch"
After a long packed flight we arrived at the hotel and was welcomed in like it was a family/close friend returning for a visit whom they haven't seen in a while. Our family of 4 were at the hotel for about a week and never met a staff member who didn't have a warm smile. The 2 rooms we had were nicely decorated and well appreciated after all long day of sightseeing and traveling around the city. There were days that we went out for breakfast and there were days we took advantage of the complementary breakfast at the hotel. The hotel is conveniently located to eateries/restaurants, grocery stores, shopping, museums, parks, etc...These locations can be reached either by foot power or by trams, which is also a very short distance away. We are all ready considering when our next trip back to Amsterdam will be...one thing is for sure, we will be booking rooms at this hotel again. Perfect location. Big and small rooms. Clean. Nice breakfast. 24hr coffee latte cake tea. Under half an hour to schipol using tram outside (5) to station south and then the schipol train. 10 or 15 minutes by 5 or 24 to the center. Excellent hotel with a quiet location yet close enough for all the sights of Amsterdam. Very clean and worth the 4 star rating. Girls and Mark at reception could not have been more helpful. Special thanks to breakfast chef when she went and made me more scrambled eggs when I mentioned how nice they were. Don't pay for breakfast when you book it's less expensive at the Hotel. Great hotel- wonderful service, clean and renovated room, walking distance to shopping and museums. I recently spent a weekend in Amsterdam with my wife and found this quiet gem in Amsterdam. The front desk was very helpful pointing out the local attractions. The room was spacious, clean, and renovated. My favorite was the window/door that opens onto a tranquil courtyard. Look forward to returning with the rest of my family. There are no negatives. Nice location on a quiet parkway in an upscale neighborhood, tram stop three blocks away, an interesting walking street with many restaurants and shops one block away, warm and cozy, well-arranged breakfast room/lounge, very helpful staff, and 15 minutes from the airport (take train to Amsterdam Zuid, then Tram 5 toward Centraal Station, get off at third stop Gerritt v. d. Veenstraat, go left at second traffic light on Appollolaan, Delphi is one block). I normally don't eat breakfast at hotels but the buffet looked so good I had to try it. It's a smidgen pricey but a very good value and will fortify you for a full day of whatever you're doing, even sumo wrestling. To conclude, a winner by any measure. I recently had the pleasure to visit Amsterdam with family and friends. We stayed at this hotel and I must say, their beds were so comfortable, the rooms were nice and clean. The staff was very friendly from check-in to check-out. They offer breakfast for guests staying at their hotel. Mixture of hot and cold items. You can't go wrong staying here. Beautiful area, not too far from all the shops. I found it a really good place to stay. It was clean comfortable and warm. Room we had was peaceful, staff were friendly and helpful I would stay there again it was in a great location. Tram stop just round the corner. You couldn't here the traffic at all. "nice place would stay there again"
"Worst hotel I've ever stayed in"
Avoid staying here at all costs. Rooms are terrible, very dated, dirty and in REAL need of renovating! My sheets had dry blood on it!!! The door barely opens due to a cupboard right in front. Terrible layout. The bathroom was ok-ish but again very dated. At €150 / night for a small room is is very overpriced too! Never again. "Very pleasant hotel in calm location"
Best Western about 15 minutes by tram (number 5 or 24) from Amsterdam Centraal railway station). Located in a fairly prosperous suburb of Amsterdam but only 15 minutes' walk to the Museumplein. Hotel not double glazed so low level early morning traffic noise may be in issue for some. If this is the case ask for a room at the back. Staff uniformly friendly and helpful. I stayed in this hotel on business and I did not like it. The rooms were spacious but it was still feeling cramped. The least comfortable beds ever. The TV reception was poor. It's a very generous 4 star. The one thing good was the excellent wifi. The location is also not bad. The staff didn't seem to know much about anything outside the hotel so you cannot get advice from them. Stayed with a group of friends but only for one night as we were on route to Germany. Hotel is in a quiet location but trams are just at the end of the street and Amsterdam centre is only 15 minutes on the tram. We arrived early for check in (due to sailing times) and the staff were very helpful and friendly, free tea or coffee. Rooms were also quiet and comfortable which led to a good nights sleep. Parking can be a problem if travelling by car. "Nice price for a nice clean hotel "
A great place to lay your head and rest up! Price was very reasonable for Amsterdam ($107). We had a bed that was two twins pushed together with separate blankets, which was odd to me. Possibly just the way Europeans create a larger bed, not sure. Located in a very quiet neighborhood. My husband and I went for a walk at 11:00pm and there were only a few bike riders out. Coffe and tea available anytime in the dining area. Breakfast was about 14 euros per person. It looked ok, not 14 euros worth in my opinion. Fruit, coffee, and cake was offered at no charge. We were able to navigate our way on foot to the red light district after the Van Gogh museum but decided to take train back after dark. I recommend this hotel and I would definitely stay again.